Hanoi (VNA) – Links between enterprises and coffee and pepper farmers need to be enhanced to improve the economic value and competitiveness of the two products. This idea was agreed on by Deputy Minister of Agriculture and Rural Development Le Quoc Doanh and representatives from the Vietnam Coffee-Cocoa Association (VICOFA) and Vietnam Pepper Association (VPA) at their working session on April 11. VICOFA General Secretary Nguyen Viet Vinh said that enterprises and farmers currently do not connect well because of intermediaries who benefit much from business deals. In 2016, Vietnam ranked second in the world in coffee exports. It sold 1.78 million tonnes of coffee for 3.34 billion USD, up 32.8 percent in volume and 25 percent in value. However, export value remained low as most coffee beans were exported unprocessed. Similarly, Vietnam mainly exports raw pepper, but a lack of varieties and diseases are causing a decrease in the quality of Vietnamese pepper. 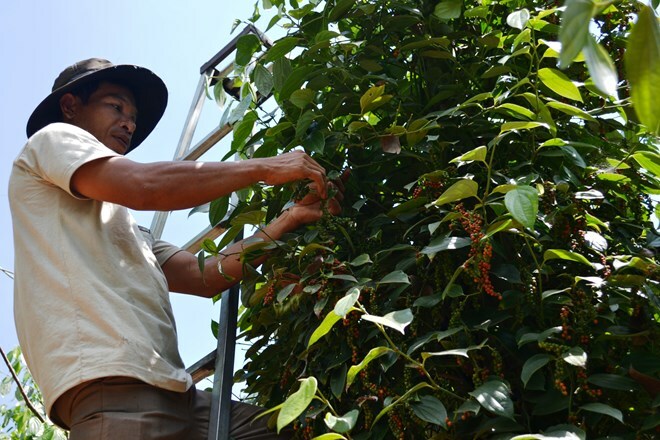 VPA Deputy General Secretary Nguyen Mai Oanh said that although the ministry of agriculture and rural development established a pepper research centre in Gia Lai province, Vietnam has to date have no standard set of varieties. She requested more efforts to find good pepper varieties suitable for Vietnam’s land and weather. Foreign partners are willing to pay 10-20 percent higher than normal if Vietnam can provide clean and safe pepper, she added. According to Deputy Minister Doanh, 98 percent of Vietnamese pepper is shipped abroad. Therefore, he asked businesses to work with farmers to ensure safe and sustainable pepper production.